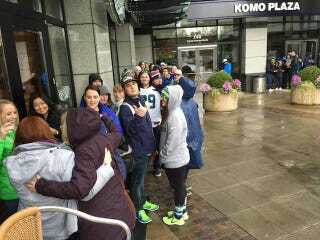 A lot of Seattle Seahawks fans no doubt had a very sad time last night, but one particular group had what I am willing to bet was the saddest time of all. But just like the errant throw at the end of that drive, one bag of Skittles managed to be intercepted by a sprinkler head, setting it off and drenching those inside the bar with a soaking spray of water. The water seeped through the bar floor and into the top floor of the parking garage here at KOMO Plaza, and set off the fire alarms to boot. The people in the picture above are the wet, displaced bar patrons who didn't even get to see the end of the game. Look at those poor, smiling saps, still riding the wave of Lynch's catch and hopeful that the team was putting the finishing touches on a game-winning drive. They have no idea. Head over to KOMOnews.com to see more pictures of the very sad and wet bar.